Dark R. Reaper is the alter-ego and compatriot of the 20 year-old De'Andre R. Richardson. He resides in the Undrworld and in Denver, Colorado. Black clothing-wearing, skull-toting, Mohawk-sporting Nick Cross has a bad attitude and believes not even death can touch him. But when Angelina Asmalia, Lady of the Underworld, comes calling, he somehow can't help but accept her offer of becoming a powerful....something. Her cold and wrenching grip is the first step on a crazy journey that has Nick reaping souls for his life. With the help of his mentor, guardian, demon frenemy Kre, he adopts the name Necross and starts figuring out what it means to be the king of the underworld. He soon finds out that things aren't as great as he thought they were going to be and that there really are some things that can be worse than death. The simple perils of the underworld like ghouls and monstrous spiders are nothing to the sinister conspiracy that is winding its way through the heart of the underworld. 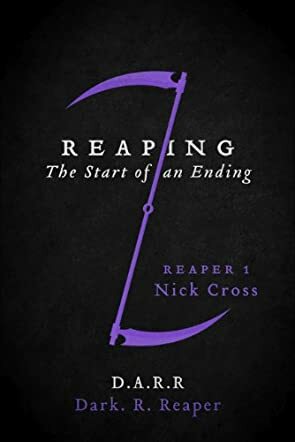 Dark R. Reaper tells the tale in Reaping: The Start of an Ending. Reapers are a cool field of the paranormal genre that is rarely given its time in the spotlight. While vampires and werewolves might seem like the more adventurous of the supernatural creatures, there is always something hauntingly eerie about the specter of death coming to get unsuspecting mortals. I liked Nick Cross. He was a bit disagreeable, but his story was cool and he really grew along the way on his journey. I believe Reaping would be better suited for a younger audience. The writing was a bit childlike and fits best with the tween or preteen audience. While the content sometimes dabbles in the teen realm, many teens would be put off by the young-sounding dialogue and story, while preteens wouldn't mind it as much. Reaping was a darkly entertaining adventure that will thrill and terrify kids to their heart's content.